An undemanding low budget sci-fi / horror genre film that has just enough tension to keep fans interested. Richard Anderson as Dr. Paul Mallon: a doctor who specializes in tissue culture. Elaine Edwards as Tina Enright: Paul’s fiancée, who is a painter and the object of the Faceless Man’s attention. Luis Van Rooten as Dr. Carlo Fiorillo: works at the Museo di Pompeii and who examines the strange body removed from the ruins of Pompeii. Adele Mara as Maria Fiorillo: Carlo’s daughter, who once had a relationship with Paul. She has finished her training as a doctor and now works with her father in the museum. Gar Moore as Dr. Enricco Ricci: a rather undeveloped character who has feelings for Maria but the jealousy angle and resentment of Paul didn’t really feature. Felix Locher as Dr. Emanual: works at the museum and translates the inscriptions contained on a medallion from a box found with the Faceless Man. He tries to convince the others about the truth of the curses and strange forces surrounding the Etruscans and the Faceless Man from Pompeii. Jan Arvan as Police Inspector Renaldi: Investigates the first murder but unlike Dr. Emanual, believes that a human killer was responsible. Bob Bryant as Quintillus Aurelius: a Roman slave/gladiator in love with his master’s daughter. Due to their respective stations in life, Quintillus was denied marriage to this daughter of a senator. After Pompeii’s destruction, he had been preserved in a state that was not quite life, nor was it death. He has now risen from the ruins of the past to be reunited with his lost love who he believes is his beloved Tina. What if you lived in a “future time” where our current notions of time as being a linear progression starting from the past, moving to the present and then proceeding on into the future were replaced by something different? Time itself might be seen as being like a giant circular vinyl LP record (for those who can remember!) consisting of grooves grouped into tracks representing different time-periods. The album might be infinite in size and there may even be an infinite number of such albums. The question is; how might one move out of a particular groove, escape from the track it is a part of and cross over into another track? What if we all had a latent or dormant ability to witness events occurring in the past and that such an ability could be stimulated by micro or Nano bio-technical enhancements, chemical stimulation and intense meditation practices? What if such procedures could enable you to produce behind your closed eye-lids a kind of small time-lens or bubble through which you could see events in the past unfold before you like in a movie? Of course, what would unfold before you would be from a random era and would consist only of visual images devoid of the auditory and olfactory elements of life in a given time period and location. Ah, but the colours! Who would’ve thought such colours would’ve been possible at that period of time? One such time mind-traveller might be witnessing a street scene in which some young men sporting straw boater hats with coloured ribbons around the crown boisterously striding past a couple of young ladies attired in long pastel coloured afternoon dresses. Suddenly, on a rather uneven and rutted road, a metallic mechanical monstrosity shakes and vibrates into view. The cacophonous sounds it makes and the stench that emanates from its exhaust can only be guessed at from the terror-stricken reaction from a nearby horse pulling its load of produce, as well as from the fumes that seem to lash out in all directions from the metal monster’s posterior. Another time mind-traveller, however, might be witnessing the destruction of the city of Pompeii in 79 A.D. with the eruption of Vesuvius. 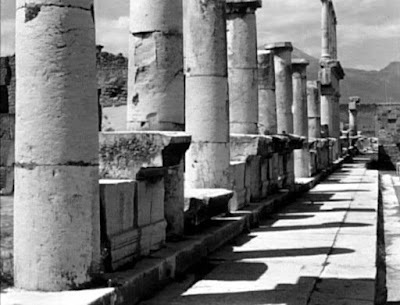 Just imagine what events our mind-traveller would be witnessing only "79 years after the birth of Christ, (when) the city of Pompeii ceased to exist! Destroyed by a mountain of seething hell known as Vesuvius. (Imagine!) On a quiet August afternoon, almost 2000 years ago, the volcano erupted, the Earth shook, day became night, birds fell dead from the sky, fish died as the oceans boiled, and the people of Pompeii perished under an avalanche of volcanic ash and stone, burned, suffocated, crushed……"
From the above temporal flight of fancy, it is this view of a slice of the past that leads us to the first of the films from the year 1958 that is offered up for your enjoyment and consideration: Curse of the Faceless Man. It is a tale in which past and present seem to merge in a most terrifying way…. 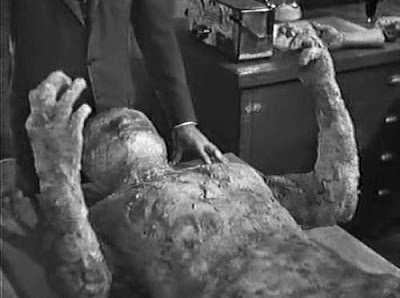 First of all, as the film opens, we see title and credits roll over the featureless form of a man lying on a marble slab in a museum: a petrified snapshot in time from the year 79 AD of one who bore witness to the eruption of Vesuvius and its laying waste of city of Pompeii. 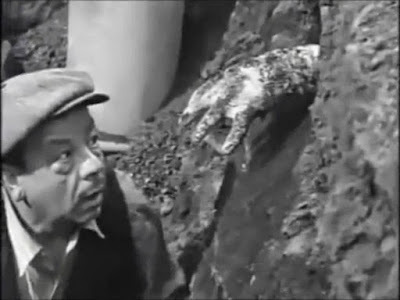 While a labourer is working at the Pompeii dig, dirt in the trench he is working in suddenly moves and a box then emerges, followed by a hand pushing its way out of the ground…..
As the mysterious featureless body is being transported to the museum, it begins to reach out from its wooden packing crate at the back of a VW truck just behind the unsuspecting driver. After Maria, daughter of Dr. Fiorillo, and Dr. Enricco Ricci arrive at the museum, Enricco tells Maria that he would have preferred her father had called in someone other than Paul to assist. Enricco is jealous as Paul and Maria had had a previous relationship. Could this form a sub-plot or a basis for some kind of developing tension? Dr. Fiorillo informs his daughter, Paul and Enricco about the gold jewel box and its contents that was discovered with the mysterious figure. The bronze medallion contains an inscription in Etruscan and was sent to Dr. Emanuel, a specialist in ancient languages. Later at the scene of the accident. 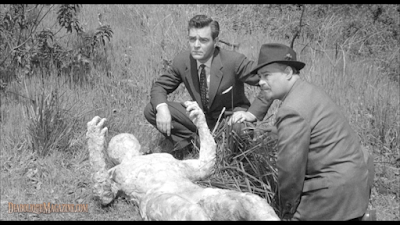 Dr. Fiorillo and Enricco examine the seemingly petrified ancient body while Paul and Maria examine the damaged truck. Paul informs Maria that he is engaged to be married to an artist, Tina Enright. Does Maria still harbour feelings for Paul who appears to have had no trouble moving on? “The house on the fourth hill of Pompeii shall fall. Between me and what is mine shall perish. …. The fires of the earth shall consume them. I am the son of Etruscan gods. Paul visits his fiancée, Tina Enright at her apartment. Tina has been painting a figure of a “bound man.” The subject of her strange painting was inspired by a dream she had the night before. It was as if she had been “forced to paint it….to bring it to life.” The figure in the painting has his “hands bound as if in slavery.” Not surprisingly, Paul is sceptical and thinks that the matter concerning Tina’s dream and the death of the truck driver is nothing more than a coincidence. 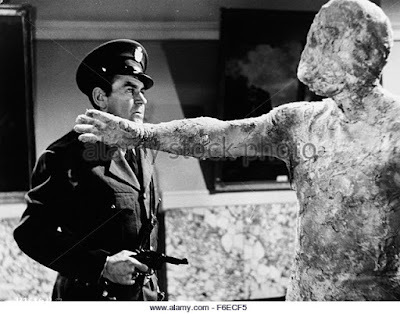 Paul is to return to the museum to answer further questions by the police and Tina demands to see the mysterious body. 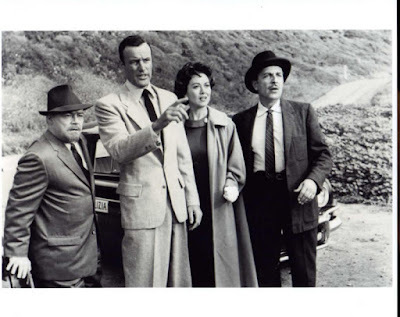 At the museum, Police Inspector Renaldi questions Dr. Fiorillo, Maria and Enricco. He informs them that Tony was indeed murdered, but believes that the killer is a “great deal younger than 2000 years.” As far as he is concerned, his job is to go after “motivation’ rather than chase ghosts. After Paul and Tina arrive at the museum, Tina relates her story to Dr. Fiorillo and the others. She then asks Dr. Fiorillo if she can sketch the body but is refused permission to do so, at least not until Paul completes his examination. Later on we see a restless Tina at home in bed having nightmares. As if under a spell, she then gets up, dresses and proceeds to the museum. 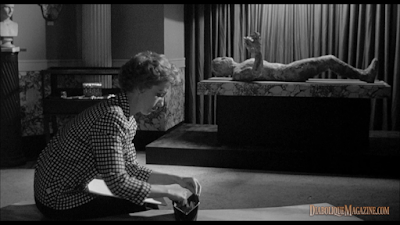 Once at the museum, Tina enters the display room and begins sketching the remains of Quintillus. At first Tina seems to be unaware of the subtle movements of the body on the slab but there is a sense of unease and tension as Quintillus moves almost imperceptibly slowly. Suddenly Quintillus sits up, leaves the marble slab and begins walking towards Tina. She notices his advancing form and screams, which alerts the guard who is on his rounds. Tina faints just as the guard enters the room. The guard fires his revolver at Quintillus but the bullets have no effect on Quintillus’ impervious outer crust. Paul and Maria return to the museum and together with Dr. Fiorillo conduct a kind of an experiment. Dr. Fiorillo places the brooch on the floor close to where Quintillus is lying. Suddenly, Quintillus comes to life, gets up off the slab and picks up the brooch. He then advances towards the three observers. Paul tries to wield an axe and strike Quintillus with it but it has no effect on Quintillus’ protective outer casing. 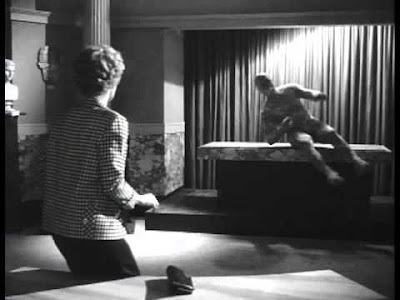 Quintillus merely brushes past Paul, breaks through the display room doors and exits the museum. It appears that Quintillus is making his way to Tina's apartment. Dr. Fiorillo, Maria, and Paul arrive at Tina's apartment and as they remain outside, Quintillus arrives, breaks in and makes his way to where Tina is sleeping. Tina awakens with the sound of the door breaking. She screams and runs in terror when she sees Quintillus. Tina soon finds herself trapped in the basement of the building. Just before Quintillus can grab hold of her, he suddenly collapses to the floor. But why? Tina confesses, “I knew it was coming for me” on account of a dream she had. In relation to Quintillus pinning the brooch on Tina, it is explained that it was the “custom of Etruscan civilisation” for a man to pin a brooch on the one he loved; in this case despite a separation of 2000 years! Dr. Emanuel asks Tina to accompany him to his home to talk, but requests that they stop on the way and visit the Cove of the Blind Fisherman. This will be a kind of test in which Dr Emmanuel will observe Tina’s reaction to the location which was where those fleeing the volcano in 79 A.D. attempted to make their escape. As Dr Emmanuel and Tina walk to the water's edge, Tina starts to remember events that took place 2000 years previously at this “scene of violent death.” In grief and horror she cries out that she can see, “hundreds of them all trying to escape the volcano….I can almost hear their screams!” Soon after this seeming recovered memory episode they both drive away in Emanuel's car. Back at the lab, Paul and Dr. Fiorillo discover a chemical (which sounds like “Thalidomide?”) which is derived from ammonia and was used in the mummification process by the Egyptians. They deduce that Quintillus must have been saturated in this chemical and that the heat of the volcanic eruption may have resulted in his life force. Meanwhile, Dr. Emanuel has employed hypnotic regression on Tina and has recorded her utterances on tape. We hear Tina recounting her past life as Lucilla, the daughter of a Roman Senator. She goes on to state, “I feel that something terrible is going to happen” in reference to the curse placed on her family by the slave Quintillus Aurelius. Quintillus threatened to escape and take Lucilla Helena as his wife. However, Tina (as Lucilla) declares, “How can I return his love? 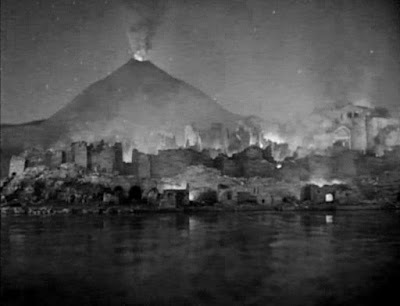 I am an aristocrat and he is a slave!” Lucilla’s house is destroyed with the eruption of the volcano. Paul informs Dr. Fiorillo that he intends to get Tina out of Italy that night, but Dr. Emanuel believes that Tina can only be free when the curse itself is broken. 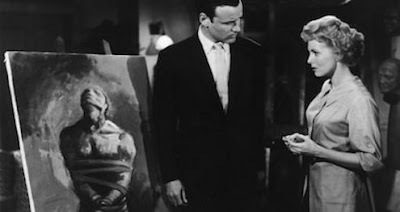 At the museum in a scene where in this case life seems to mirror art, Tina is seen holding a knife with which she has cut the canvas bonds securing Quintillus. Meanwhile, Enricco in the display room, hears a noise and notices Quintillus advancing towards him. He fires his gun at the approaching figure but it has no effect. 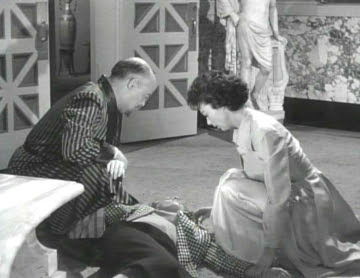 As Quintillus gradually strangles the life out of Enricco, Paul arrives on the scene and tries to help Enricco. The more powerful Quintillus throws Paul to the to the floor while Quintillus picks Tina up in his arms and carries her out of the museum. Dr. Fiorillo and Maria drive up to the museum and notice that the front door is open. They enter to find Paul and Enricco on the floor. Paul is OK but Enricco is taken to the hospital for treatment. Dr. Fiorillo later proposes that it was radioactivity in the ground that kept Quintillus alive. X-rays showing a human being inside the casing of Quintillus outer covering had apparently given him mobility. Renaldi soon springs into action and orders his police force to scour Naples for Quintillus and Tina. 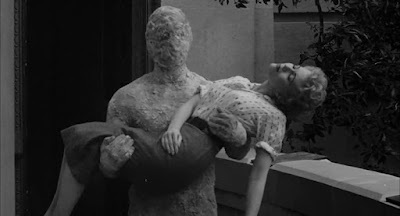 In a scene in which Quintillus seems to be acting out an escape from the erupting volcano, he is carrying Tina towards the sea. He is soon spotted and the police are dispatched to the Cove of the Blind Fisherman. When they arrive, there is concern that an attempt to save Tina might result in her accidentally being shot. Paul quickly leaps into the surf and rescues Tina. As he carries her up onto the beach, Tina awakens from her trance and wonders why they are all at the beach. "The strange narrative of Quintillus Aurelius ended here in the quiet waters of the Bay of Naples. The story is finished, and perhaps Quintillus Aurelius has found the true Lucilla Helena where mortal men don't walk and time is eternal." 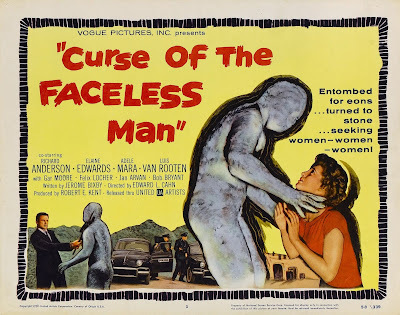 The Curse of the Faceless Man finally closes with a shot of the body of Quintillus on the marble slab in the museum. And slap us out of our recurrent stupidity. 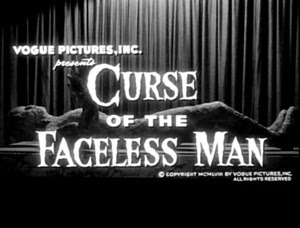 Curse of the Faceless Man with its somewhat clichéd and predictable plot does tend to repeat many of the elements contained in Universal Studios, The Mummy (1932), so we do feel that we’re on very well-trodden and all too familiar territory. 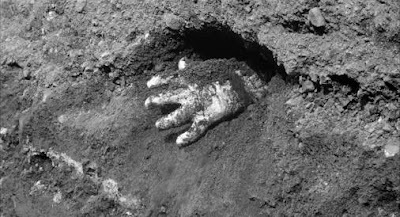 The premise of a man having been saturated with Egyptian embalming chemicals, then sealed in volcanic ash and preserved by the radiation deep within the earth is at least an interesting one. Shot in only six days, the film was originally released on a double bill with the excellent, It! 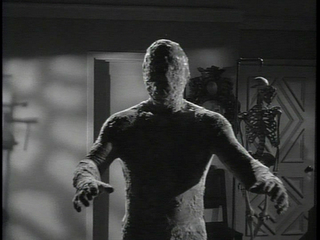 The Terror From Beyond Space (1958), also scripted by science fiction author Jerome Bixby and directed by Edward L. Cahn. Felix Locher who plays Dr. Emmanuel was the father of actor Jon Hall (Charles Locher) and did not begin acting until he was 76 years old! 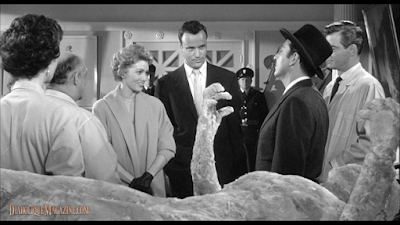 He also played Dr. Carter Morton in the movie classic, Frankenstein's Daughter (1958). 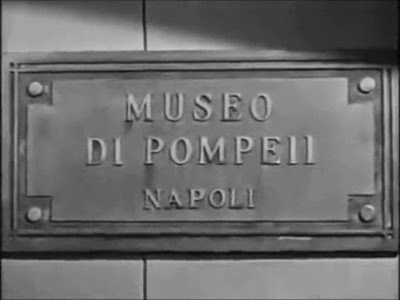 The "Museo di Napoli" featured as a location in the film was in reality Griffith Observatory. “The Cove of the Blind Fisherman” was actually a stretch of beach in Venice, California. 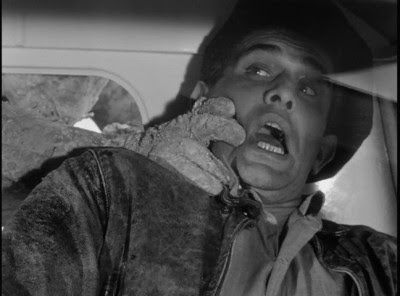 The annoyingly frequent narration was spoken by the character actor, Morris Ankrum who we are acquainted with from his performances in several sci-fi films featured in this blog.